The first step will be selecting which type of Game you wish to play. Score is shown on our standard scorecard with the team that is up being shown as 1UP, 2UP, etc. 2 golfers Low ball wins a point. No point awarded for a hole that is tied. Score is shown on our standard scorecard with the player that is up being shown as 1UP, 2UP, etc. If all square then AS is is displayed for both players. 4 golfers Team based game using stroke play rules. The best individual score among teammates is used as the team score for the hole. 2-4 golfers Skins is a multiplayer game where the player with the lowest score on the hole takes the award, or skin, for the hole. If two players tie the 'skin' carries forward to the next hole. 4 golfers Team based play. Each team hits one ball from tee. Team players then alternate shots until ball in the hole. You can select a Full Round, the Front 9, the Back 9 or Customize. If you select Customize you will be able to select exactly which holes you wish to play. 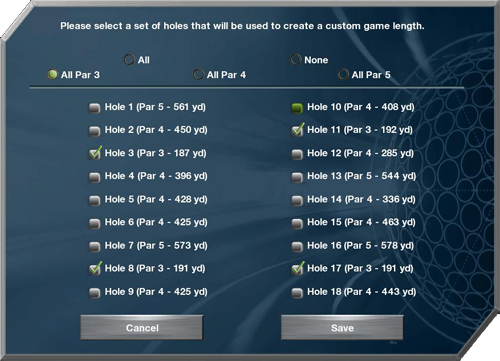 You can easily select All Par 3's, All Par 4's, All Par 5's or any custom combination you wish. Your next step is to select which course you wish to play. Select the course from the list by clicking upon the Course Name. To the right an image of the course and a brief description will appear in the Course Description window. Courses with the Star icon indicate courses new to you. Courses with a Green Dot icon are Platinum Courses that are available for Preview. How this process works can be seen in Previewing Platinum Courses. Select the Players you want to participate in this Game. Make sure to select the correct number of players for your Game Type! Choose players from the dropdown lists. You can Create a New Player as well. This will take you to the New Player window. To remove players, you must work backwards from player 4 to 1. This means you must set player 4 to "---NONE---" before Player 3 will have that option. If you wish to edit any of a player's settings - Shot Type, Tee Box, etc... - you can click the button next to their name. This takes you to the Edit Player window. Before you enter your game you may wish to modify the settings. To do this click the Settings & Options button. 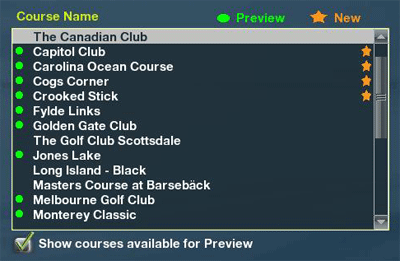 This will take you to the Settings & Options window where you can modify your Game Rules, Course Physics and more. Note: All of these Settings & Options are available from within the game except for the weather. If you wish to change the weather conditions - Clear, Cloudy or Foggy - you must do so before you enter the game. Once you have made all of your selections, click the Play button to proceed to the Game.